Please take a moment to listen to Claudine’s poignant recollections of childhood and swimming to understand why VOR’s director is Swimming to Rwanda. Thanks to the generosity of Kerry Propper from Chardan Capital, every donation will be matched up to $20,000. Thanks to the International Association of Genocide Scholars (IAGS) for including VOR in their 10th Biennial Conference “The Aftermath of Genocide: Victims and Perpetrators, Representations and Interpretations,” which will be held in Siena. It was an honor for VOR to be included in the 19th National Commemoration hosted by the Rwandan Embassy. 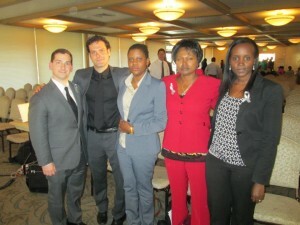 VOR’s director Taylor Krauss shared his thoughts on the power of testimonies in Rwanda today. Other speakers included Ambassador Eng. James Kimonyo along with testimonies from Tabitha Mugenzi and Kalima Kizito.